Win or lose, Zenyatta will retire after Saturday's Breeders' Cup Classic. Win, and she finishes her career without having ever lost. And she'll be even money by post time. Is there some horse sexism at work here? Easily the best horse the world has seen since Cigar, Zenyatta is 19-for-19 in her career. No horse has ever gone undefeated over a longer career except for Kincsem, and she died in 1881, back when jockeys were just children and plowhorses often raced (historical details not factchecked). So why isn't she a household name among casual viewers, unlike one-and-done burnouts like Super Saver or Mine That Bird? The fact that those horses won the Kentucky Derby is why. Odds are you watch 2 or 3 horse races a year: the Derby and the Preakness, and the Belmont Stakes if the same horse wins the first two. Zenyatta didn't start racing until she was three years old, missing out on the Triple Crown races. Which doesn't mean she hasn't won anything impressive. Thirteen of her wins have been in Grade I races. Fourteen of her wins have been by at least a length. Hell, she even won a race that was named for her after she dominated it the two previous years. Perhaps if she didn't only run on the West Coast, we'd have taken notice that she's something special. The only knock on her is her gender, and the fact that she's rarely competed against male horses. But she can beat them. She's proven it. 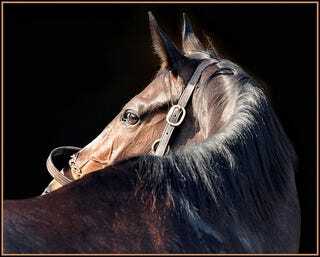 She handily won last year's Breeders' Cup Classic (the most competitive race of the year, Kentucky Derby included), the first female horse to ever do so. She's probably going to win it again. Then she'll call it a racing career, and she still won't get the respect she deserves. Thanks to biology, she'll only be able to foal a limited amount of horses, as opposed to the males put out to stud, who can pop and go at will. Zenyatta's never even won horse of the year, though that will be rectified. The true fans of the sport know what they've seen over the past three seasons. The rest of the public has no idea what they've missed.